Italians don't spend their time inside fountains! However, they like to take time to appreciate beauty, art and quality of life. Do you want to bring your Italian knowledge to a superior level? Do you wish to better understand the backbone of Italian culture (something that Italians know deeply because they were born and raised in Italy)? Can the Italian lifestyle help you to improve your life? Have you ever heard the expression: 'Italians work for living, they do not live for working'? How is the Italian lifestyle changing now, with globalization and the economic crisis? Which strategies are Italians taking in order to improve their lives in the face of the crisis? Practice the Italian language and be a part of the Italian culture. Enjoy Italian cinema and understand how Italian cinema has marked the growth of Italian society and lifestyle after World War Two. Cinema is one of the backbones of a country's culture. This program will help you to better understand Italian culture and to reconnect to it on a deeper level. 'Life the Italian Way - Coaching Program' develops through the analysis of famous movies, explores Italian daily life-style and how the values of Italian tradition might still satisfy the needs of modern life. Testimonial: I have been fortunate to have been able to participate in both the "Your Renaissance" and the "Life the Italian Way" programs. There were so many things that I liked about these programs that it is difficult to single any one in particular. For example, the materials were excellent. That is, the works of art that we examined in the "Your Renaissance" sessions were incredibly beautiful and interesting. 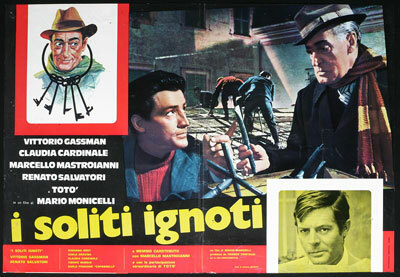 The same is true of the wide cross-section of films that were reviewed in the "Life the Italian Way" sessions. The way these different art forms, paintings and movies, were presented within the context of Italian history, life, and culture made the sessions really come to life. I found myself looking forward to the next session with anticipation and enthusiasm. Please note: The selection of movies might change depending on availability. Italy after WWII. The Italian Comedy - Bread, love and fantasy. The art of getting along. Catholics versus communists. Four important concepts of Italian culture (and "underculture"). Italy after WWII. Neorealism. How Italians rebuilt Italy and how they managed everyday life. The 60's and the Italian Comedy - The American dream and the Italian dream. The vision of Fellini. The 70's and the Italian Comedy - Italians realize that the system is corrupted. The 80's - Denouncing the Italian System or dreaming again. The 90's - A need for a change. The future of Italian cinema and Italian society. Italian sciencefiction? A new century - Italian lifestyle - holding on to Italian tradition and adjusting to world changes. Testimonial: Maura is a fantastic teacher! Prior to finding CyberItalian I had seen a few different tutors and also attended group lessons so I have experience of different styles and methods of teaching and have to say that for me the lessons with Maura are by far the best. I love the structure the CyberItalian lessons give to the class - it keeps the lessons fresh and interesting. The lessons are really a pleasure. Also, unlike group classes where sometimes I would hide at the back and not get involved I always get a fantastic learning experience out of my lessons with Maura - there is nowhere to hide - in a good way! Let your friends know about Life the Italian Way - Coaching Program. Broad-band (DSL or Cable) Internet access - Recent browser (IE, Firefox, etc.) with Flash 6 or later - Skype - Headset with microphone. 'Life the Italian Way - Coaching Program' is a very special and unique educational experience where you will bring your Italian language and culture to a higher level, you will understand how Italian cinema has marked the growth of Italian society and lifestyle after World War Two, and you will explore Italian daily life-style and how the values of Italian tradition might still satisfy the needs of modern life. Do you have a multisystem video player?